Bombay Electronics offers guaranteed low prices and free shipping on region free DVD player, unlocked cell phones, multi region blu ray players, multi-system TV and various 220 volt or dual voltage electronics and appliances. Nowadays, an increasing number of Americans are incorporating Indian cuisine into their menus for various reasons. Some opt to add Indian dishes to their diet because of the amazing spices and flavors involved. Others choose Indian food for its well documents health benefits. If you are hoping to join the ranks of those Americans and experiment with Indian cuisine too, we’d recommend purchasing at least one essential kitchen appliance. It’s called the Indian Mixer Grinder. Indian mixer grinders, as you may have guessed, can perform multiple tasks. That’s what makes them so ideal for preparing traditional Indian cuisine. They are often capable of grinding whole spices, mixing sauces, extracting juices and chopping up ingredients for chutneys. In addition, they frequently come with multiple jars complete with their own lids. The lidded jars are truly handy to have when you are making a meal that requires a variety of components like masala paste and paanch phoran. The best place to find Indian mixer grinders in the USA is Bombay Electronics. We’ve got several models that are compatible with American designed electrical systems. One of them is the Butterfly Desire. 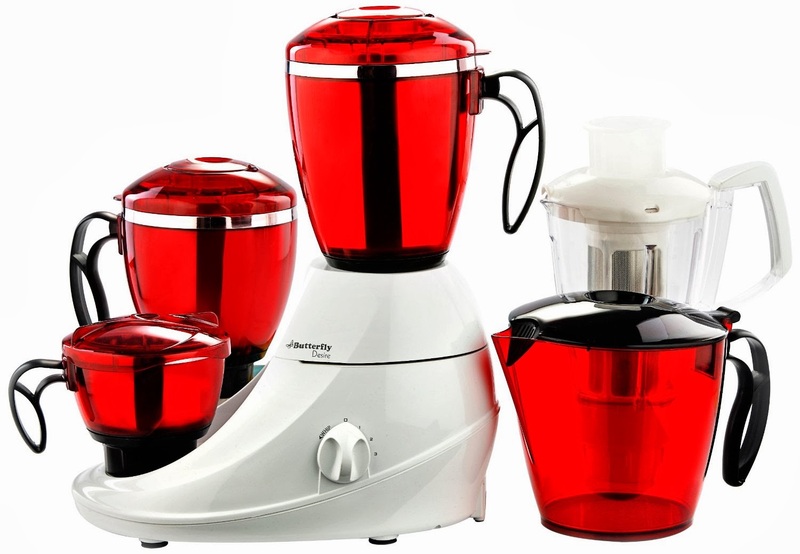 It is a 4-jar juicer mixer grinder that’s powered by a heavy duty, 1 HP motor. Thus, it can make short work of any spices that need to be broken down into fine powders. Furthermore, the Butterfly Desire Indian mixer grinder also comes outfitted with a juice extractor and a pusher. Therefore, you can use it to make flavorful beverages like ginger lemonade, watermelon juice and raw mango smoothies. The Butterfly Emerald is another Indian mixer grinder that is wonderful for use in American homes. It features a quiet, low vibration, powerful, 750 Watt motor and comes with four stainless steel jars. Buyers can also count on the mixer grinder to have an automatic overload cut-off and stainless steel blades. For a closer look at these Indian mixer grinders in the USA and others, please contact us at (877) 736-6349. We offer a low price guarantee and free, fast shipping on all orders that exceed $25. Kitchen appliances now become the most important part for every home. Mixer grinder is seems to be a multi purpose appliance. I am using one of the best mixer grinder that work perfect in processing any kind of food. I wonder are there any sewing and embroidery machines available in India like Brother. These branded appliances are highly priced due to their superior quality. Besides this the non branded home appliances are also available in the market with much cheaper rate. Thank you for very usefull information..
Is thermodynamix inc. remained open on weekends too? I'l visit your online shop on Saturday to buy some stuff. thermodynamix inc.